COMMENT #1: Throughout this draft EIS the term “in appropriate locations” is liberally used. The final EIS should identify where these “appropriate locations” are. Dike 12 levees extend from the terminus of Layfette Road south and west to the Avon Bend area. Contained in that area should be identified where exactly would it not be appropriate to construct a 100-year certified levees. Also the term “other flood measures as necessary and appropriate” is also liberally used. The final EIS should state with specificity what those measures are and provide a through environmental including but not limited to a complete hydraulic analysis on how those “other flood measures” will impact surrounding communities upstream and downstream of their proposed location. Comment #2: The final EIS should provide justification for such a provocative statement. Where did the 2018 date come from? While I am somewhat sympathetic to the cities frustration with the GI process, it is my understanding that the GI process will be completed well before 2018. If the city has information, to the contrary it should provide it in the FEIS. 3. Remove approximately 30 acres of land from the UGA and exchange for land located at the northeast corner of Pulver and Peterson Road for a school site. Comment #3: Essential Facilities are essential to the health and welfare of the whole population and are especially important following hazard events. The potential consequences of losing them are so great that they should be carefully inventoried. Vulnerability is based on the service they provide rather than just their physical aspects; therefore, not only their structural integrity and content value should be considered, but also the effects of interrupting their functions. Essential facilities include hospitals and other medical facilities, police and fire stations, emergency operations centers and evacuation shelters, and schools. Given the verbiage above why would the City of Burlington recklessly endanger the life and safety of it school children by placing a school, a critical/essential facility in the location that has historically flooded. 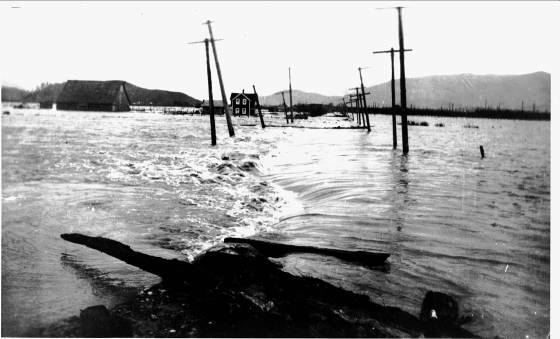 The photo below is from the 1917 flood event showing waters crossing Peterson Road not far from the location Burlington wants to build its school, in a volcanic floodplain, underlain with volcanic lahar material, adjacent to two active earthquake faults, and located on “prime farmland”. Come on people, this is not a good idea by any stretch of the imagination. 4. Evaluate the concept of adding Raspberry Ridge to the UGA so that sanitary sewer is provided to mitigate potential health hazard in event of a flood. COMMENT #4: It appears that this proposal is just another excuse to further create intense density within the City. The Final EIS should identify the terminus of the current sewer lines, the route taken to the farm worker housing identifying all properties that would benefit from a sewer line extension, the current zoning of the property and how that could change with city services made available and how the extension is going to be paid for. Given the cities, well-publicized opposition to the farm worker housing project residents must be assured that this is not just another attempt to have them removed from their current location by charging them excessive hookup fees. Given the obvious violation of Executive Order 11988 it is assumed that no federal funds will be used for this project. It is also apparent that the cities presumed worries about “contamination by sewage from failed septic systems” is superficial at best. If the levees fail, and eventually they will as they all do, any possible sewage contamination from the housing project will be the last of Burlington’s worries as every farmer’s manure pit from Burlington to Concrete will also be flowing through Burlington. Not to mention all the chemicals stored within Burlington itself. COMMENT #5: This statement seems to be adding now another purpose of this proposal. If the City is successful in someday achieving 100-year certified levees what will the cities policy be with respect to requiring development to be built to what elevation? 100 year flood levels or flat on the ground? The Final EIS should also identify by what means the city perceives are available to “provide incrementally greater protection” and what if any environmental impacts those perceptions would entail. Thus we can tell from a review of the above documents that FEMA performed their analysis as if the levees did not exist (thus giving the residents of Burlington a terrible false sense of security on how deep the water will be in case of a levee failure) and that the informal floodway in the lower valley was from the landward toe of the levees to the landward toe of the levee on the opposite side of the river. Also since a regulatory floodway was not established that Burlington was to conduct themselves under 44 CFR 60.3. (c)(10) meaning that “no new construction, substantial improvements, or other development (including fill) shall be permitted within Zones A1-30 on the community’s FIRM, unless it is demonstrated that the cumulative effect of the proposed development, when combined with all other existing and anticipated development will not increase the water surface elevation of the base flood more than one foot at any point within the community.” The FEIS should extensively discuss and show with hydraulic analysis that the massive development east of Interstate 5 has not already raised the flood waters more than one foot at any point in the community, especially concentrating on the area east of the interstate. The FEIS should also speak with specificity to the issue of where it has or as the case may be why it has not ever enforced the verbiage of 44 CFR 60.3.(c)(10). COMMENT #7: Instead of touting the dam owners with their failures to provide Burlington with not promoting further growth in the bottom of a volcanic floodplain by forcing them to provide something that Burlington has not yet stated that they are willing to pay for, the public would be better served if the FEIS shows how while the smaller flood events in recent years have in fact been better managed by the Corps and the dam owners that this style of management has a downside as well as it lulls the lower valley into another false sense of security that makes people believe that they are totally protected by the storage already provided by the dams. The FEIS should verbalize that neither the Seattle City Light dams nor the Puget Sound Energy Baker dams have the capacity to contain large flood events and that once their capacity has been reached it will be like the dams did not exist at all and major damage will be the end result within the lower valley floodplain. COMMENT #8: While this is an admirable purpose/goal the FEIS should extensively address how the City of Burlington will finance the loss of generating capacity to Seattle City Light. COMMENT #9: While there is no dispute that elevating buildings is a “negative impact” on the pocketbooks of developers, said negative impact is far outweighed by the safety provided by such elevation to the residents/businesses that move into said structures. The FEIS should in detail discuss the cost involved of raising a building either on fill or post and pier construction versus the damage to the contents of a business when the levees break and a catastrophic flood event occurs. 4. A viable regional strategy is not in place. An array of flood hazard mitigation strategies exist and have been studied for many years in Skagit County, but there is no regional strategy for approving or implementing them. 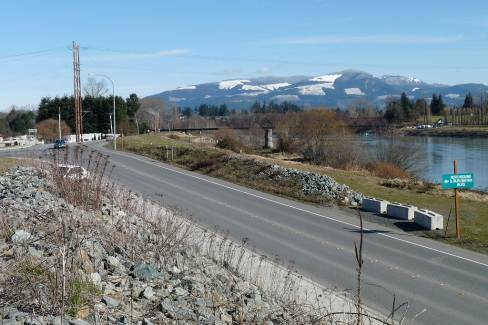 Skagit County is working toward development of an update of the Skagit County Comprehensive Flood Hazard Management Plan. The City of Burlington is not represented on the Advisory Committee and the scope of work appears limited to the Corps of Engineers General Investigation without consideration of independent studies by Burlington and Skagit County. There does not appear to be an emerging consensus on the best course of action, for a number of reasons, including the fact that few of the proposed measures will work with the hydrology set forth by the Corps. COMMENT #10: I would first like to address the text highlighted in yellow above. While it is true that the City of Burlington is not a sitting voting member on the Advisory Committee, the City has its City Planner as the chairperson of the Land Use Sub-Committee and Dike District 12 (Burlington’s admitted partner in this DEIS, sits on the Dike and Drainage Sub-Committee both committees of which report to the Advisory Committee. If the City of Burlington really feels that it needs three bites at the apple then maybe they should contact the Mayor of Mount Vernon who has boycotted the last 6 months worth of meetings and who refuses to give his voting proxy to his City Engineer or other City employee and see if he would be willing to give up his seat at the Advisory Committee table to the City of Burlington. While I have no authority to speak for the rest of the members of the Advisory Committee I for one would welcome the City of Burlington taking Mt. Vernon’s place. With respect to the second paragraph while I must admit that the process is painstakingly slow progress is being made. At the last Advisory Committee meeting the committee endorsed the GI study evaluating Lower Baker Dam storage, threw out the “better utilization of Nookachamp Storage project” as a project that will not work for many reasons including impacts on salmon, ownership of the levees proposed, cost, and as Burlington has often admitted a project that will not work unless their consultants hydrology is used. Not to mention the fact that this project had been looked at in 1966 and again in 2001 and rejected both times. 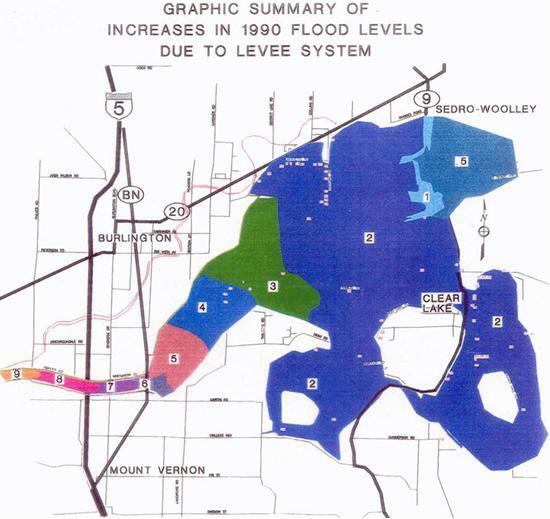 If the City of Burlington strongly feels that extending levee protection to Sedro Woolley is a viable option then the FEIS should include a complete hydraulic analysis to show the impacts on upstream and downstream property owners. In 1979 the Corps GDM stated that such action would increase BFE’s by about 4 feet which clearly would be unacceptable to those impacted. COMMENT #11: The FEIS should state with specificity when Burlington states “get the levees certified for 100 year flood protection” if it means the entire levee system or as it stated in paragraph #1 page 6 “in appropriate locations”. The FEIS should state where the “appropriate locations” are if it is the latter. It should also state how high the levees will be for them to be certified as compared to how high they are now. Also the FEIS should indicate the width of Gages Slough (high ground to high ground) and the amount of water the City feels will flow through this area. COMMENT #12: Really? Just in some locations? The FEIS should state with specificity which areas if feels will not need flood insurance. How about this area? 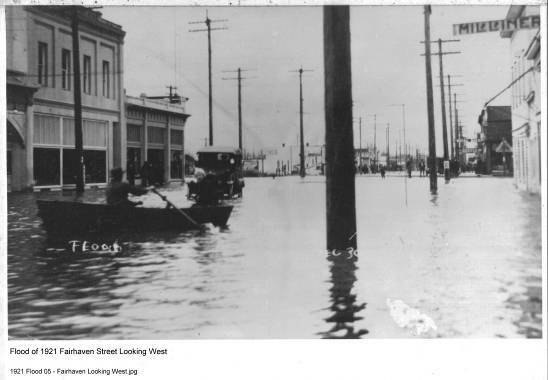 Will it be out of the 100 year floodplain and if so does that mean that all property south to the Skagit River behind the levees will also be out of the 100-year floodplain? Unless the City of Burlington widens the 3 bridge corridor more then its current plan of only 400 feet, gets the water past the City and gets rid of it before it gets to Mt. Vernon as it has been described in the two documents above, there is no other alternative to keep the floodway designation from going through Burlington. COMMENT #14: This is a terrible option for our second largest urban area to undertake. Levees are the worst form of flood control available to mankind. All they do is promote a terrible sense of false security. Giving the floodwater a place to go instead of trying to keep it out is a far better option. The FEIS should include an analysis of widening the three bridge corridor and providing an emergency outlet for floodwaters in any greater amount then the 1990 flood event. All other options harm individual property owners more then they currently are being harmed. The emergency outlet option does not provide any more harm then will currently be experienced under current conditions. This option also has the impact of lowering the BFE figures for Burlington and Mt. Vernon, and perhaps most importantly does away with the floodway designation for both urban areas. COMMENT #15: See discussions in comments #10 and #14 above. Almost everything mentioned in the paragraph above is a complete waste of time and money. Especially putting control structures in the Sterling area and establishing a flow path to the north into the Samish Valley. The last thing the Samish farming community needs right now is more induced flooding. COMMENT #16: The PIE hydrology has been rejected by every federal and state agency involved for several years now. The chance of FEMA or the Corps accepting the PIE hydrology is on its best day slim and next to none. COMMENT #17: If this is in fact the chosen major alternative then the FEIS must include the location of said levee segments, how they will be modified during the certification process and what the impacts of said modifications will be to upstream and downstream property owners. Also the FEIS should state with specificity on what the other flood control measures will be and what the cumulative impacts (in accordance with 44 CFR 60.3. (c)(10)) of those measures as well as what will be the impacts to upstream and downstream property owners, their impacts on the environment and what will be the economic cost and how will the measures be funded. 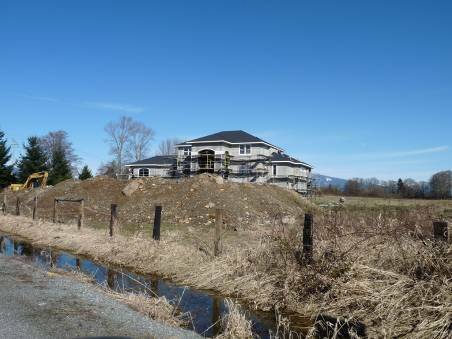 COMMENT #18: The FEIS should elaborate on exactly what “levee and control structures” will be constructed in Skagit County’s rural jurisdiction and what are the hydraulic and environmental impacts of said structures. COMMENT #18: See comment #3 above. Really people, this is a terrible idea. I don’t care how many $100,000’s of dollars the school district paid for the land. They made a bad investment of district dollars. COMMENT #18: See comments 13 and 14 above. This is a terrible objective which will ultimately alienate your neighbors and receive no public support amongst the voters of Skagit County and you will end up with exactly what you got in 1979…….nothing. No public support equals no funding. Massive fill being placed in a flow path just upstream and adjacent to Gages Slough in an area where the levees broke in January 1935. See 1/31/35 C.H. Source: 2/20/1987 FEMA letter to BNSF. While to my knowledge this is the only time CFR 44 60.3(c)(10) has been enforced, the fill material BNSF railroad placed in Gages Slough is still there today. COMMENT #20: The levees have never been considered in establishing BFE’s in the past. See documents contained in comment #6, specifically the 5/22/1984 FEMA letter to Burlington. The FEIS should change the above paragraph appropriately to reflect what actually happened. The only difference today is that the BFE’s are determined as if only one side of the rivers levees fail unlike 1984 when no levees were considered and “sheetflow flooding” was the method used. COMMENT #21: Nice to see that Burlington is prepared to make consultants’ rich because I really feel that is all that would be accomplished. Appealing and ultimately taking the issue to court will result in a resounding defeat for the City, its taxpayers, and make only the consultant assisting the City happy as he laughs all the way to the bank. The City Council needs to seek outside legal advice before this course of action is taken. COMMENT #22: The FEIS should identify with specificity where these “farmland” areas are and exactly how Burlington plans on moving the water onto these “paths”. COMMENT #23: The FEIS needs to state clearly what documentation Burlington is relying on to make the Gages Slough statement. Gages Slough is the old channel of the Skagit River before it moved to its current location approximately 1,500 years ago. If the slough is recognized that it is not just where the water is sitting but the high ground area to the high ground area it is several hundred yards wide and will contrary to popular opinion carry a significant amount of water and in most cases at a high rate of velocity. Before the FEIS can be published, a complete topo map and hydraulic analysis should be conducted. It has carried the water before and it will carry the water again. It is only a matter of time. COMMENT #24: This paragraph is nothing but a scare tactic to generate commercial interest in the proposal. Our neighbors to the south in Lewis County have experienced 500 year back to back flood events. Despite the hardship imposed on the poor and the homeowners, commercial development apparently is still continuing, no matter how foolish it might be. The FEIS would be a lot more creditable if this paragraph was modified to explain the terrible inconvenience of flooding events instead of trying to scare residents into this holistic approach of public policy. COMMENT #24: With respect to the highlighted text above I view this as a public admission that this DEIS document is nothing more then a total BS exercise that contains no specifics, no environmental analysis with the final conclusion of “trust us the check is in the mail”. I’m sorry if that seems kind of harsh but this document accomplishes nothing other then a feeble attempt to say that you recognize that you have a problem but whatever you need to do is covered by existing codes so you can do anything you want to. What a waste of taxpayer’s time and money. If I was on the Burlington City Council, I would be outraged that staff spent any money on this document at all. COMMENT #25: If this was indeed a true EIS it would address what those adverse impacts would be and to what degree Burlington’s plans will make them worse. One is now left with the impression of what is it exactly that Burlington is trying to hide. COMMENT #25: It “may result in more water”? The FEIS should have a complete analysis of the quantity of water moving downstream and what plans does Burlington have to mitigate that impact? COMMENT #26: As the below diagram shows it is not the BNSF railroad bridge that is the restriction to flood conveyance as much as it is the configuration of Dike 12 and Dike 17 levees. The below diagram was provided by a hydraulic analysis performed by nhc of the impacts of induced flooding due to the current levee system. Even if you accept the argument that the bridge acts as an impediment to flood flows the impacts of said impediment are minuscule as compared to the levee system itself as the flood waters simply scour out the area under the bridge. The FEIS needs to identify the amount of levee setbacks planned by the City of Burlington, Mt. Vernon, Dike Districts 12 & 17 and the WSDOT. COMMENT #27: Interesting choice of words but the FEIS should explain in detail what is meant by “environmental justice”. There really isn’t very much contained in the rest of this document that hasn’t already been addressed in the comments above as most of the verbiage beyond this point is nothing more than a repeat of the above. However there are one or two statements that need addressing. COMMENT #28: So at long last the City of Burlington has admitted that the activity of the Diking District over the past decade or so constitutes “improvements” to the levee system. Improvements unlike maintenance (i.e. mowing the lawn) require a variety of permits. The FEIS should add an appendix to show all the SEPA environmental checklist, grading permits, Shoreline Management permits and what analysis has been done under 44 CFR 60.3(c)(10) that have been issued for all the “system upgrades” performed by Dike 12 in accordance with “all federal state and local regulations including the Critical Areas Ordinance, federal and state air and water quality standards, state noise standards and other applicable laws and regulations”. Without the production of those permits the argument could clearly be made that the current condition of Dike 12 levees are nothing short of illegal which could have long range implications for any flood control project put forth by the City of Burlington. COMMENT #30: The FEIS should address the presence of the volcanic lahar that the levees sit on as well as the entire town of Burlington, the two active earthquake faults under or in near proximity of the levees and the town, as well as acknowledge the fact that the Skagit River floodplain is a volcanic floodplain subject to flood flows from Mt. Baker and pyroclastic flows from Glacier Peak. COMMENT #31: What is the status of the NEPA review and who is the lead agency? How does one obtain a copy or get on the mailing list for any DEIS or FEIS for the project?